How many pine cones can managers expect from their longleaf pine forests? Longleaf pine cones take more than two years to mature. Photo by Bryan Mudder, USFS. Every year, U.S. Forest Service research ecologist Dale Brockway attempts to answer this question. His most recent report suggests that 2017 will be a good year for longleaf pine cone production. 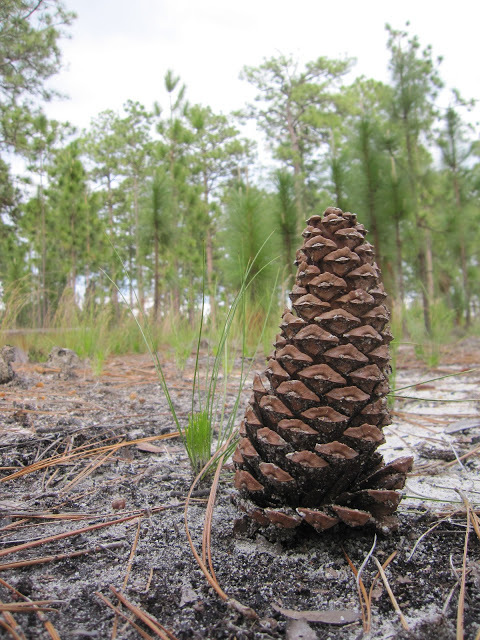 “Across the region, we expect longleaf pines to produce an average of about 62 cones per tree,” says Brockway. Other sites in Florida and Louisiana are on track to produce fair crops of 25 to 49 cones per tree. In North Carolina and South Carolina, crops will generally fail this year. Less than 10 cones per tree are expected there. Longleaf pine cone production is a complex process that varies across time and space. The process can also be influenced by many environmental factors. As a result, good cone crops are infrequent and bumper crops even less common. “News of a good cone crop usually alerts forest managers to get busy with site preparation during the summer and nursery managers to plan for cone collection during the fall,” says Brockway. When a good or bumper crop is expected, managers often use prescribed burning to prepare seedbeds. Prescribed fire – if it exposes the mineral soil – can improve seed survival and growth. For uneven-aged longleaf pine stands, the natural cycles of seed production are usually enough for stands to regenerate. However, knowing the quality of cone crops is still important to landowners and forest managers who want to restore longleaf pine forests. Bill Boyer, a Forest Service researcher and longleaf pine devotee, began monitoring cone production across the region and writing annual reports in 1966. Brockway joined Boyer in 2003 and has led the monitoring effort for the past decade. Each spring, natural resource managers, researchers, and technicians collect data at 11 sites across the Southeast. These sites include private forest land, state and national forests, research centers, and military bases in Alabama, Florida, Georgia, Louisiana, North Carolina, and South Carolina. 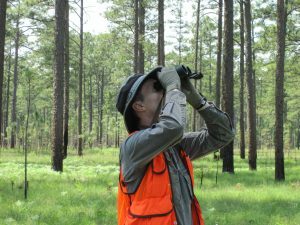 Dale Brockway uses binoculars to count longleaf pine cones. Photo by Yoko Brockway. 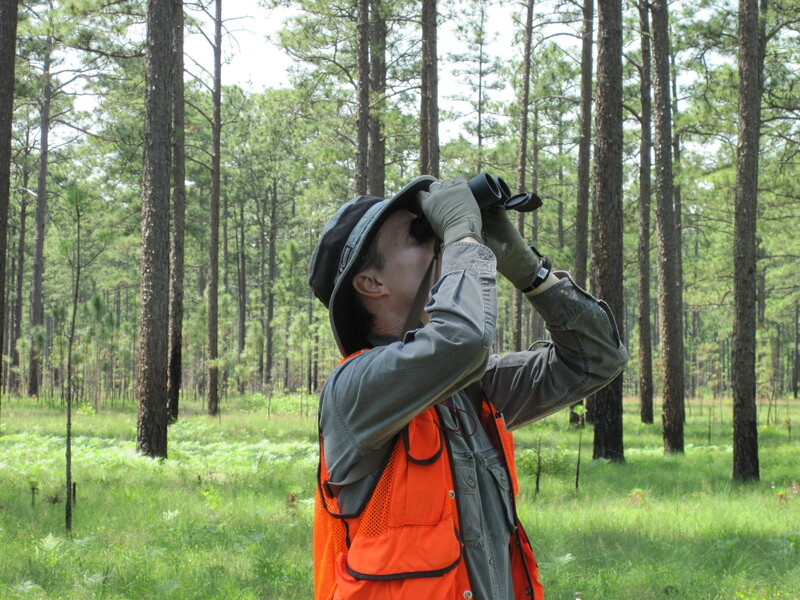 Data collectors use binoculars to scan longleaf pine tree crowns for conelets and green cones, typically in April. The green cones will finish maturing in about 6 months, releasing viable seeds in October. Over the entire 52 year period, the regional average is 28 green cones per tree. Since the mid-1980s, fair or better cone crops have become more common. Scientists are not sure why – the increase could be related to genetic, environmental, or management factors. Longleaf pine cone production can be quite variable. This natural variation means that even when crops are forecast to be low, some stands may produce an abundance of cones. For more information, email Dale Brockway at dbrockway@fs.fed.us.